Photos taken November 2008 unless noted. The historic "Honeymoon Cabin" at Grant Grove Village. For more photos see the Grant Grove Village Photo Tour. It is not known when the first guest facilities were built at Grant Grove Village, but by the time the General Grant National Park was created in 1916 there were already a few minimal guest facilities present. These consisted primarily of primitive cabins and tents spread around a swampy area known as Bradley Meadow. Around 1924 a gas station, photo studio, and market were built to serve the increasing number of mostly day-visitors. The Park Service was not happy with the scattering of existing businesses with multiple ownership and started looking for a single concessionaire who would agree to build new facilities and run everything. In 1925 the newly formed Sequoia and General Grant National Parks Company, under the direction of Howard Hays, was given a contract to provide all guest services in both General Grant National Park and nearby Sequoia National Park. Hays was the former concessionaire for Yellowstone National Park who was now retired. The park service felt he had the skills to fix things up and convinced him to come out of retirement. Rather than build large hotels the park service decided that the new guest facilities for both parks should be rustic complexes of individual guest cabins. Hays had plans for a new lodging complex drawn up by the famous rustic style architect Gilbert Stanley Underwood (Underwood designed the rustic lodges for many of the western National Parks.) They named this complex of new buildings The Lodge, but it soon came to be commonly called "Tent City". Plans included a new small lodge/lobby building, a relocated cabin to be used as a reading room, 4 new duplex guest cabins with private baths, a new bathhouse, and lots and lots of tent cabins. These facilities were all constructed between 1927 and 1930. Nearby, a separate area known as Meadow Camp already existed and consisted of a group of existing tent cabins. These were remodeled into rustic housekeeping cabins by replacing the tent-tops with roofs, and a new bathhouse/office was constructed. 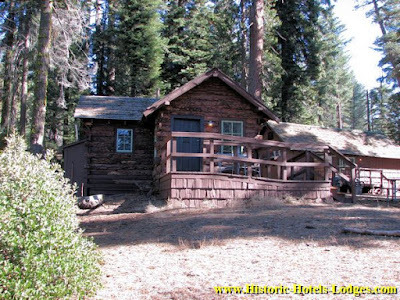 So by the early 1930's Grant Grove Village had two separate and distinct guest lodging areas, The Lodge and Meadow Camp, which although owned by the same company, were operated as separate facilities. Cabins from both areas still exist today although The Lodge area no longer goes by that name. In 1932 a new store and lunchroom were built fronting on the main road. This building remains today and is now the gift shop. In 1936 the gas station was replaced with a new one, built by the Standard Oil company, which while now closed, also remains today. A restroom building was built by the CCC adjacent to the gas station around 1940, it also still exists. Little changed from then until the 1960s. In the 60's the Mission 66 program was launched by the Park Service with the goal of modernizing the National Parks. Under this program a new modern 1960's style coffee shop (with interior architecture very similar to a Denny's Coffee Shop from that same era with counter seating surrounded by individual tables) was added to the rear of the existing store, and a new Visitor's Center was constructed across the street from it. Many of the cabins were repaired and remodeled. In 1969 the old Lodge/lobby building was remodeled into a market, but retained much of the original design including the fireplace. Sadly, in 1993 the Lodge/market burned to the ground and Grant Grove Village lost what was probably it's most architecturally significant historic structure. A new store and post office were built fronting the highway between the gas station and gift shop buildings in 1994. For a lot more historic details and photos of the Grant Grove Village buildings take the photo tour starting on the next page! Page 1 - This page. The Grant Grove Village area in King's Canyon National Park has a number of historic buildings and cabins. Registered guests of both the cabins and the lodge are welcome in the lodge's lobby where there is wifi. The "Honeymoon Cabin" or "log cabin" (officially it is called cabin #9) is the oldest structure still standing in Grant Grove Village, built in 1910. It started out as a Stage Stop a few miles away in Hume Lake. It was moved to it's current location in the Lodge area of Grant Grove Village sometime prior to 1930. In the early years it served as a reading room for the Lodge guests. It was later converted into a guest cabin. It has a queen bed, carpeting, refrigerator, heater, a coffee maker, and a private bath. Cabin #9 is popular, so book early if you want to stay in it. You need to phone the reservations center to reserve the Honeymoon Cabin, last I checked it could not be booked online. 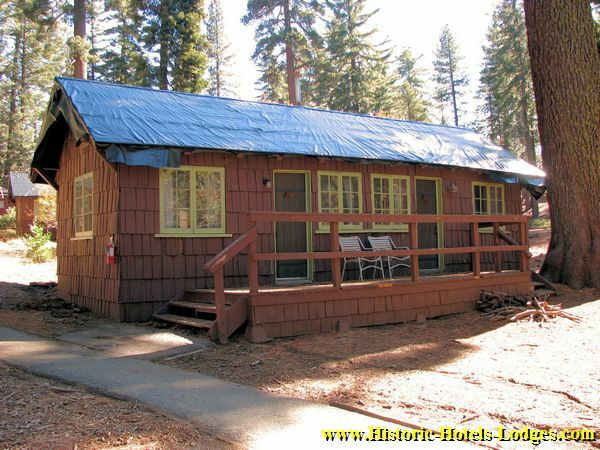 There are four historic redwood "Duplex Bath Cabins" in the Lodge area that have been renovated (8 units total.) These nice duplex cabins are heated, carpeted, have a coffee maker, private baths, and are open year-round. Each duplex cabin has a large shared porch with chairs. The duplex cabins were built in 1927-1928. While apparently designed by architect Gilbert Stanley Underwood, who is famous for his rustic park architecture, these simple duplex cabins have little of architectural significance beyond their age. The "Rustic Cabins" are small individual cabins in the Meadow Camp area that feature double beds, electric lights, insulation, carpeting, and propane wall heaters. They do NOT have private baths. Most of them date from around 1930 with upgrades since then. Each rustic cabin has a small outdoor porch with a tarp covering, picnic table, and a wood stove. A central restroom and shower building was built to replace the original bath building in 2009. The area around the cabins has also been updated, with better paths and night lighting for late-night trips to the restrooms, but a flashlight is still a good idea. The restroom building can be up to a block away from some of the cabins. The "Camp Cabins" are similar to the rustic cabins, with double beds, electricity, and heaters, but have bare wood floors, no insulation, and no porch. A trail leads to the nearby bathhouse. The camp cabins also date back to the 1930's. Bring a flashlight. For a camping-with-beds experience, try the "Tent Cabins" located in the area formerly known as The Lodge or Tent City. These cabins have 2 double beds, wood floors, wood walls, and a canvas tent roof. There is no heat or electricity, and a battery-powered lamp is provided for light. Bring a flashlight, the trail to the bathroom is dark, and the surface is uneven! They do not have a porch and cooking is not permitted. If you want to cook your own meals you will need to go to one of the park's picnic areas, the closest one is about 3 blocks away. The John Muir Lodge at Grant Grove Village was built in 1998. The lodge itself is a two-story building with interior hallways and is similar in style and layout to a modern mid-range hotel. The rooms had a major remodel in early 2015 and sound-proofing was added at that time. (It was much needed!) Most of the rooms have 2 queen beds, some have a king and a sleeper sofa. Rooms are carpeted, heated, have a coffee maker, flat screen tv, iron, ironing board, and a private bath with combo tub/shower. Heat is electric baseboard heaters (no fan.) No A/C, just open the window, it cools down nicely most nights. I like to take a small portable fan with me. The lodge building has a large lobby with a fireplace and wireless Internet. Several porches with chairs and rockers make comfortable places to hang out in the evenings. The virtual tour and photo out-takes have lots of photos of the John Muir Lodge both inside and out. 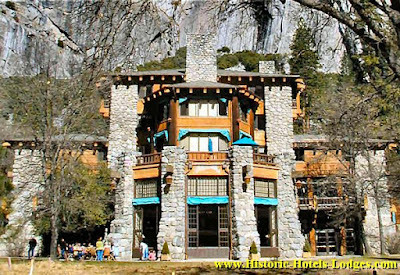 Also you may want to read my article/review of the John Muir Lodge at the National Parks Traveler website. A brand new restaurant opened in Grant Grove in 2017! The old Grant Grove Village Coffee Shop was built in 1962 and was attached to the back of the current gift shop building, in the area where the patio for the new restaurant is now located. The historic gift shop, which still remains, was built in 1933 and originally housed both the gift shop and a small lunch counter. The old 60's era coffee shop was designed in the modern style of a coffee shop of the period (think Denny's) and like a typical highway coffee shop it offered guests a lovely view of the... parking lot! A small room at the back of the 60's era coffee shop was the infamous Sequoia Room Bar. The Sequoia Room was known back in the 70's - 80's for the male employees who hung around in the evenings, trying to pick-up un-attached female tourists. (The 60's era coffee shop is shown in some of the photos on the last page of the photo tour.) The 60's era coffee shop is now gone, replaced by the new, larger restaurant and patio. The new restaurant overlooks the meadow and opened in 2017. The post office and market adjacent to the Gift Shop were built in 1994. The small restroom building between the market and gas station is historic and was built around 1940. The former gas station fronting on the main road is also historic and was built in 1936 by the Standard Oil Company. The park Visitor Center was built in 1965 on the former site of the 1933 Park Administration Building. Delaware North Companies Parks & Resorts, Inc. manages all lodging facilities at Grant Grove Village under a contract with the National Park Service. For lodging reservations see their website at Delaware North Companies Parks & Resorts, Inc. or call their Reservations Center Phone: (866) 807-3598. International phone number: (801) 559-4930. For the front desk for all Grant Grove Village Lodging call (559) 335-5500. If you would like to reserve a specific room or cabin it is best to call rather than reserve on-line. When you arrive the guest registration desk for both rooms and cabins is located inside the lobby of the John Muir Lodge. King's Canyon National Park. King's Canyon National Park is located in the Sierra Nevada Mountains on the east side of central California. There is an entrance fee to enter the park. See the Park Website at King's Canyon National Park Homepage for details on the park, including current entrance fees and road conditions. The park roads are narrow, winding, and slow, expect travel times to be longer than you might think. Speed limits are 45 mph or lower in the park. Some park roads close for several days at a time due to snowfall in Fall, Winter, and Spring. I strongly recommend visiting off-season if you can arrange it. Summers are busy, hot, and crowded. Not as crowded as Yosemite, but still you will likely encounter lots of people on trails and long waits for tables in the restaurant at lunch and dinner time. Fall and spring are less crowded than summer, but weekends can be busy. Nights and mornings in spring and fall can be cold, bring a jacket. Winters mid-week mean having the place almost to yourself, as well as deeply discounted room rates and relaxed, individually prepared meals in the restaurant! Fall season is generally free of heavy snow through October. A foot or two of snow on the ground is likely November through December. January-March often brings deep snow, typically 4-5 feet of snow depth. Spring can vary, sometimes the snow and ice can hang around well into June. I've seen mid-winter snow depths over 12 feet and one year it snowed when we were there on Memorial Day weekend (that's in late May!) So in spring come prepared for either cold or warm weather. Grant Grove has a weather station behind the visitor center, you can get current conditions and short term weather forecasts at the Grant Grove NES website. IMPORTANT! DO NOT TAKE State Highway 245 to reach the park! Your GPS unit may direct you to Hwy 245. Highway 245 is a narrow, very slow, winding road that is nothing more than an old wagon path with pavement. It will add at least an hour to the trip. You will likely see tourists pulled over to allow passengers to barf! Take Highway 99 south to Fresno, California. In Fresno exit onto State Highway 180 East. Hwy 180 in Fresno is a well-marked freeway. From Fresno, Highway 180 East leads directly into the park and passes through Grant Grove Village. From there Hwy 180 continues to Cedar Grove where it dead ends. Allow about 1 hour and 15 minutes to reach Grant Grove from Fresno. See the section "RURAL AREA!" below. From the Los Angeles basin take Interstate 5 north. A I-5 will split as you approach Bakersfield, take California Highway 99 north toward Bakersfield at the split. It is faster to take hwy 99 than to stay on I-5. Highway 99 is a major north/south freeway with services like gas and food at more or less 10 mile intervals. Continue on Highway 99 to Fresno. At Fresno exit onto Highway 180 East to King's Canyon. It will become a two lane road as it heads up into the mountains. Just follow the hwy 180 and King's Canyon signs the rest of the way. Highway 180 goes through the Grant Grove Village. Allow about 1 hour and 15 minutes to reach Grant Grove from Fresno. Faster but more difficult route from the south. The following route from the south is faster but more complicated. This is the way the locals and regular visitors go. You will probably need to ignore your GPS if you take this route! GPS units will try to put you on official state highways which are terrible roads with lots of stop signs in this area. Take these faster county roads! Take State Hwy 99 north to the town of Visalia, exit on State Hwy 198 west. Once on State Hwy 198 in less than a mile take the Plaza Drive exit. It's the first exit. Plaza Drive will become Lindara Ave then change names again to become Alta Ave when you reach Dinuba. Dinuba is a good size town and there are several gas stations, fast food, and convenience stores with restrooms if you need a break. Drive 10 miles on Hill's Valley Road (it will intersect with State Hwy 63.) After 7 miles the road will begin to wind up into the hills. It ends at State Hwy 180. Turn right (west) onto Hwy 180 and continue 27 miles on Hwy 180. You will enter King's Canyon National Park and just a few miles into the park Hwy 180 goes through Grant Grove Village. 12 miles- the intersection of Hwy 180 and Academy Ave near Sanger: gas, store w/ restrooms. 32 miles- the community of Squaw Valley: gas, lodging, store w/ restrooms. 36 miles- Clingan's Junction near Dunlap: gas, store w/ restrooms. LAST GAS! 56 miles- Grant Grove Village, store, gift shop, lodging, restaurant, seasonal snack bar, restrooms at the Visitor Center and adjacent to the store, but NO GAS is available. Fill Your Tank. No Gas. There are no gas stations in King's Canyon or Sequoia National Parks. The last gas station (and bathrooms) on hwy 180 leading into the park is at the corner of hwy 180 and Dunlap Road in the town of Dunlap. During summer months only, gas is available at Stony Creek, on the General's Highway between King's Canyon and Sequoia Parks. Rural Cow Paths. Watch out for roads, even those labeled as state highways, in the Sierra foothills that look like shortcuts on the map. They can be very slow with sharp curves and speeds of 15 mph. Many are old wagon roads or logging train rail beds dating back to the 1800's that have been paved but not straightened. Ask someone local if you are not familiar with the road. GPS units often try to route you on these roads. I know I'm repeating myself, but stay off State Highway 245! Yosemite Travelers. To get to and from King's Canyon from Yosemite you drive through the city of Fresno, California. There are no paved or easy to follow direct roads between the parks in the mountains. You must drive down into the valley and then back up to the other park. Highway 41 goes from Fresno up into Yosemite National Park. It takes about 2.5 to 3 hours to get to the entrance to Yosemite from Grant Grove. Yosemite Valley is an additional 45 minutes to an hour from the Yosemite park entrance. Sequoia National Park. Sequoia National Park is adjacent to King's Canyon. The two parks are jointly administered as one unit. A single entrance fee gets you into both parks. To get to Sequoia National Park from King's Canyon take the General's Highway which links the two parks. It takes about an hour to go from Grant Grove to the Lodgepole Visitor Center in Sequoia NP. The General's Highway between the two parks is often closed for several days or longer after storms during the winter. Highway 198 Warning. Hwy 198 between Sequoia N.P. and the town of Three Rivers is extremely steep with multiple hair-pin curves. Do not take Hwy 198 if your vehicle is not in good condition with good tires and brakes! If you have a fear of heights or do not like narrow roads on steep mountain sides you will not like this road! On the other hand, there are some spectacular vista points on hwy 198. Trailers and large motor homes over 22 foot length are not advised on Hwy 198 between Giant Forest in Sequoia N.P. and the Town of Three Rivers. If you are pulling a trailer use Hwy 180 from Fresno. Flying. If you plan to fly to the region for a visit, the closest major airport is the Fresno/ Yosemite International Airport in Fresno, California: www.flyfresno.org. Rental cars are available at the airport. The drive to King's Canyon from the airport takes 1 hour and 15 minutes. Train. Train service via Amtrak is available to Fresno, California: www.amtrak.com. There are no public transportation systems with service to King's Canyon National Park. If you can't rent and drive a car yourself consider an organized tour that uses a private bus. Another option is Lyft.com, which at the time I wrote this provided ride hailing service between Fresno and Grant Grove. It's not cheap but it will get you there! This article, the photo tour and all photos are by Jess Stryker unless noted and are copyrighted. Most photos were taken in November 2008. Any corrections or further information on Grant Grove you may be able to provide are much appreciated. Special thanks go to Thomas L. Burge, Archeologist for Sequoia-Kings Canyon National Parks, who was very helpful in assisting me gathering facts and data on the Grant Grove Village facilities. Challenge of the Big Trees: A Resource History of Sequoia and Kings Canyon National Parks. If you can find a copy, this is the best book on the history of Sequoia and King's Canyon National Parks. I have a copy and often refer back to it when visiting the park searching for history. Historic Resources Study for Grant Grove Developed Area, King's Canyon National Park, California by Susan A. Kopczynski and Chandler McCoy, June 1998; National Park Service document. This document was the source for much of the historical information on this webpage and in the virtual tour. To my knowledge it has not been published, but a copy can be obtained from the Park Service if you ask nicely.